For this batch I applied an underglaze of Amaco’s Satin-Matte White and top coated that with their Satin-Matte Clear Glaze. 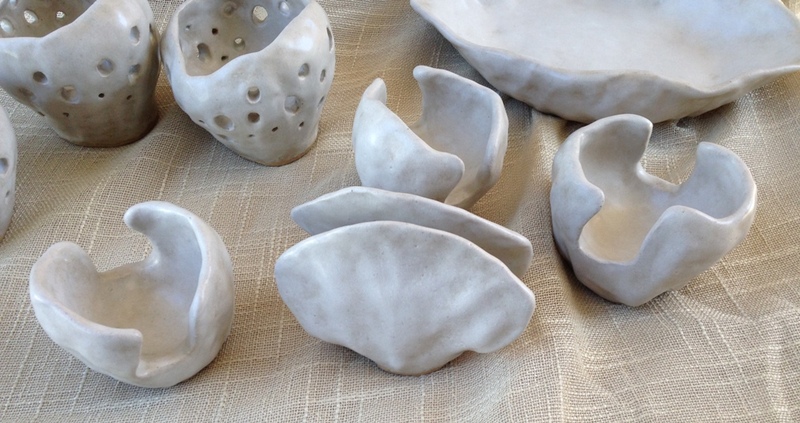 Upon firing the white and clear glazes melded beautifully creating a creamy, grayish-white hue. The underlying khaki color of the brown stoneware clay really gives a wonderful depth to the finish. 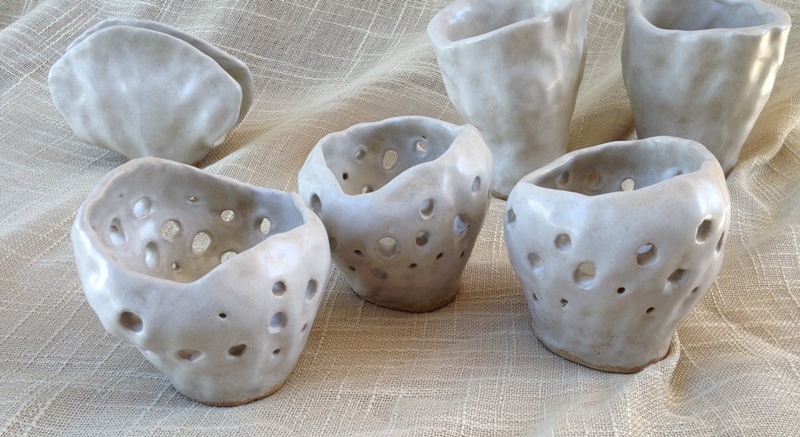 My favorites from this batch are these vaguely sea sponge-like luminaries which all miraculously survived. Unfortunately only one of the bivalve-shaped napkin holders survived, and it shrank so much I think it works better as a sponge holder. The pieces I specifically intended to be sponge holders turned out nicely though. All of the soap dishes survived- and I especially like how the clam shell-shaped ones turned out with the creamy white glaze. 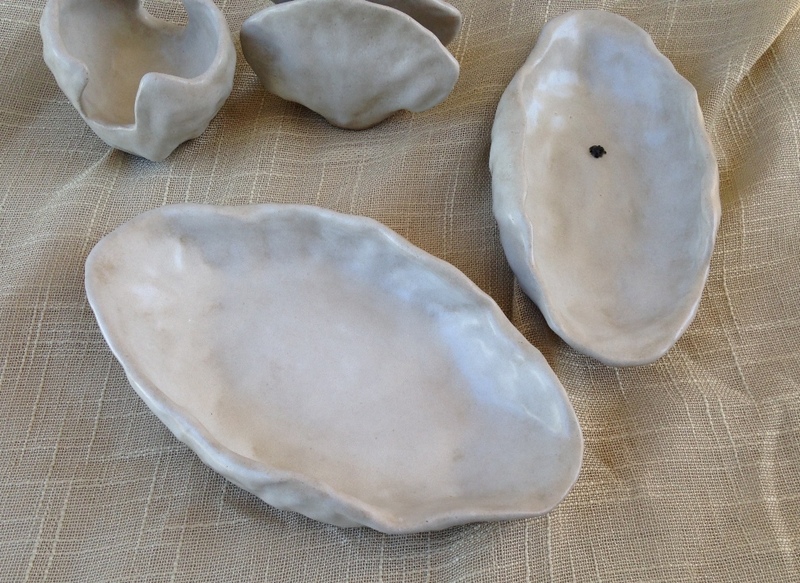 A couple of serving bowls. 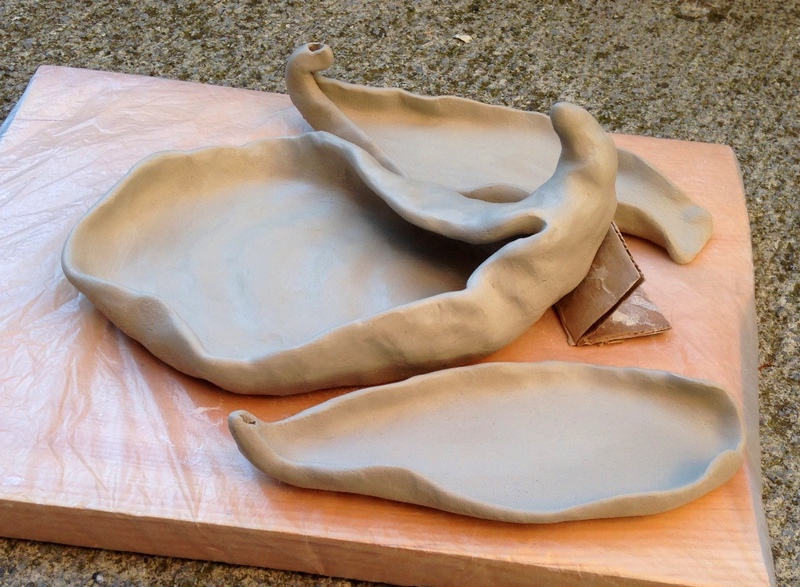 The lip of these bowls undulates which gives them built in spoon rests. 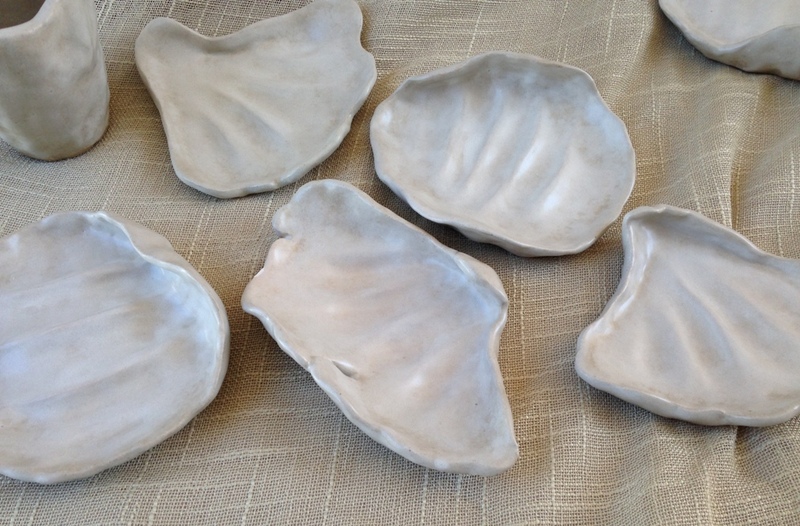 Some oyster shell shaped spoon rests- the glaze looks perfect on these. 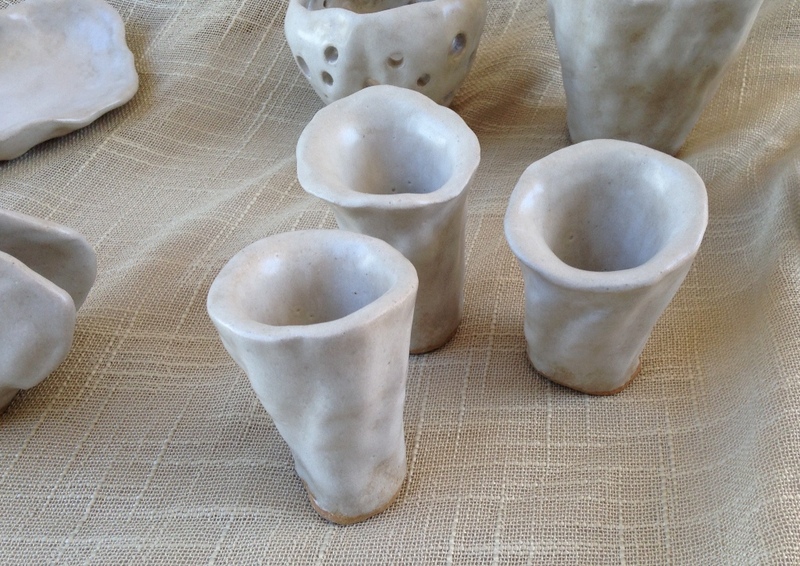 A cluster of miniature flower bud vases. 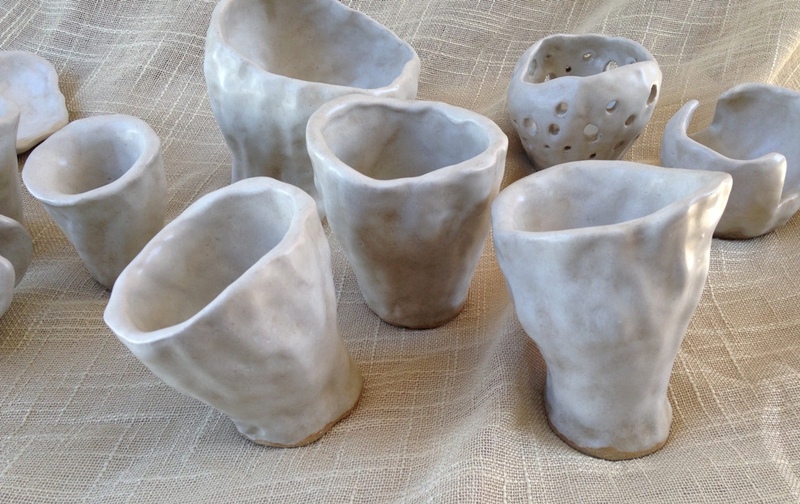 While these may seem purely decorative and very delicate these ceramics are both functional and quite sturdy. In this batch I have made a variety of kitchen implements and vessels with a new stoneware clay that should come out a dark beige color. *If* they survive I’m thinking I’ll coat them with a distressed layer of warm white glaze and over top that with a clear layer which should give the appearance of antique ironstone pottery. Two spoon rests and a soap dish. This pieces in this collection, like most of my work, has a very organic look to it. The spoon rests and napkin holders look vaguely like seashells. The napkin holders remind me of ancient brachiopod fossils. A trio of very organic looking luminaries. I really hope the luminaries survive as they were very time consuming to make. Each little hole in them is a potential starting point for cracks. With any luck these pieces will survive the slow drying process over the next couple weeks and then it will be time to glaze them. 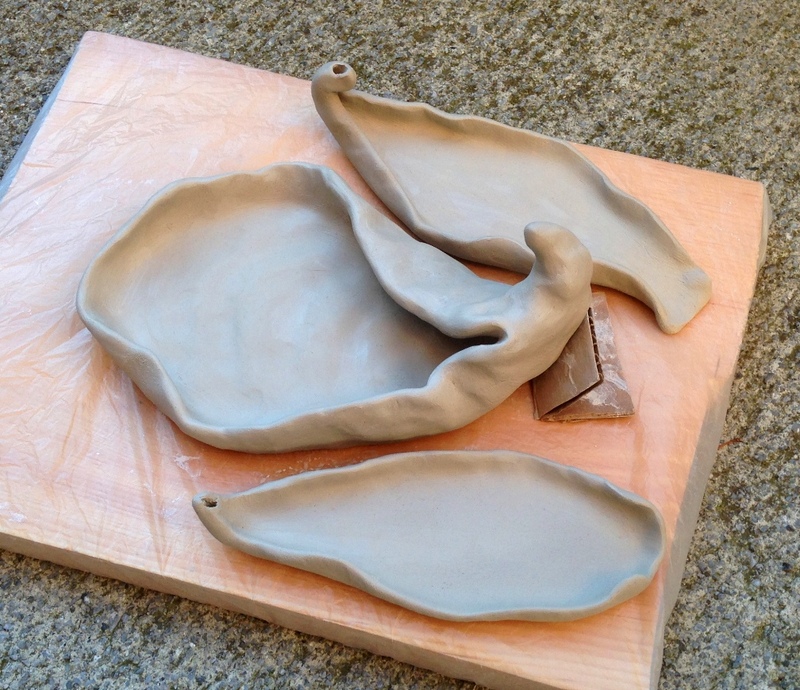 I had seen a macaroni vase in a recent issue of Better Homes and Gardens and decided I would try to make one using a flat slab of clay instead of a a wheel-since I do not have a throwing wheel. I rolled out some leftover clay, cut an hourglass shape out and rolled it up. 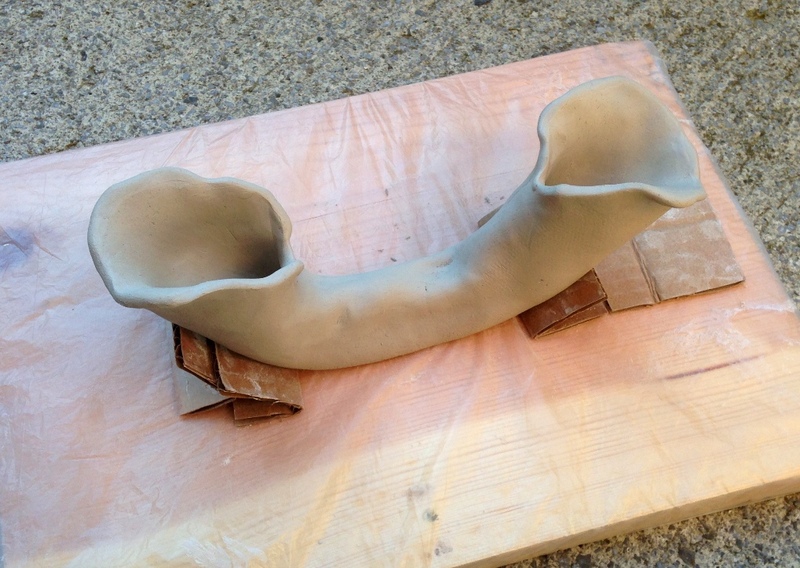 Then turned up the openings and molded the lips a little. I really hope the vaguely cornucopia shaped dish survives- it brings to mind some of the fossils I’ve found of primitive sea life.